Welcome to the Primary 5, Primary 6 and Primary 7 Literacy Support Section! 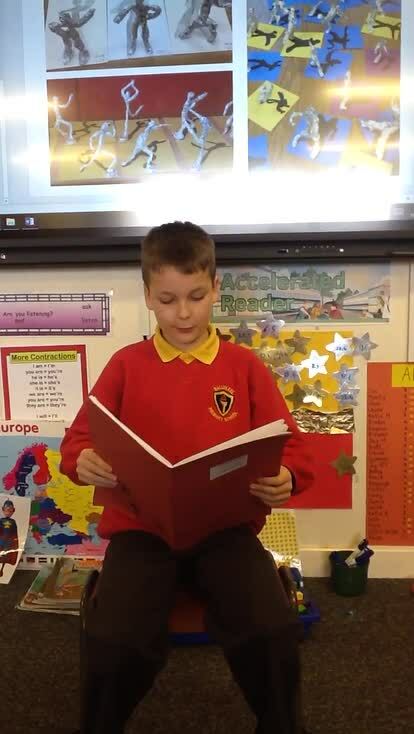 This year I have the privilege of offering Literacy Support for pupils in P5, P6 and P7 in our school. This focussed support aims to provide additional Literacy support for pupils with a specific focus upon their reading, spelling and grammar skills. Pupils engage in daily small group support sessions during Literacy time with 8 pupils in each group. The small group setting helps pupils to build their confidence, love and enjoyment of literacy. Please keep checking the website and the photo gallery to see the fun children will be having during Literacy Support sessions. Homework Each night your child will receive reading and spellings. Written English homework is sent home once a week. On returning homework please sign. Thursday night children are to revise over their spellings for the week to prepare for their Friday test. Please ensure that your child reads every night at home and learns spellings thoroughly. Continue to encourage your child to read an AR book, and to take a quizz each week. Explore non fiction texts - purpose, structure, language features and grammar. Develop comprehension skills through Reciprocal Reading Strategies and Accelerated Reader. We will focus on making conclusions based on what is read. We will use these skills to develop our writing to ensure that biographies are clear and structured. Within the literacy group well continue to focus on checking our work for simple mistakes, e.g. fullstops, capital letters and missing words. We will strive to ensure that all work is presented neatly and handwriting is correctly formed. Creative writing will focus on writing poems about Spring and writing instructional texts. Within the literacy group we will continue to reinforce learning to spell key words to use in creative writing. Explore types of sentences, and use of punctuation with written work. Within the literacy group we will continue to focus on developing editing skills, use of the dictionary and developing a joy for reading. We will use these skills to develop our writing to ensure that recounts are clear and structured. New aspects of grammar will include plurals and gender nouns. Primary 5 throughout this term we will focus on our grammar topic nouns; being able to recognise a noun and identify what it is. The class will take part in practical activities, interactive displays as well as written work to help them grasp this topic. Nouns will be covered in depth moving on to look at common and proper nouns and then collective nouns. Homework will reinforce what has been taught in class. Spellings for the group will include revision of our phonics patterns and sight words. They will also be given the opportunity to revise these in class through games, interactive and i-pads. Each morning the Primary 5 class look over sight words and will repeat, in the hope they will recognise these words again. Please ensure that all homework is completed and writing is neat and presentable. Keep reading with your child each night and to reinforce the importance of doing so. Sentence level work will focus on verbs in the present and past tense, using adverbs and different plural endings. We will also identify different common collective nouns. Please support your child with forming and joining cursive letters neatly. The skill of predicting will be introduced. Please encourage your child to predict what will happen in stories. Consider evidence (illustrations, text and blurb) to support predictions. Continue to listen to your child read each night. Please keep encouraging reading and taking tests on AR books. Primary 6 Throughout this term we will focus on grammar, comprehension, Reciprocal Reading. Handwriting and the presentation of our work is still very important and must be maintained at home and school. Grammar we are currently learning about nouns; recognising, identifying and using them, common and proper nouns and then reviewing collective nouns. Homeworks will reinforce topics covered in class. Comprehension and reading skills are practiced each week, we are currently focusing on developing a growing vocabulary of phrases and words which can be recognised and to clarify words unfamiliar to them. We will continue to follow Year 6 class work. To clarify - to work out what unfamiliar words or phrases mean. To summarise pieces of text so that we capture the main idea. Sentence level work will include use of adjectives, verbs and adverbs. We will also continue to reinforce use of basic punctuation marks. Children look at the key features of a comic strip and then plan and create a comic strip. Primary 7 It's all about VCOP!! We've been working hard on our writing skills learning about the acronym VCOP and what each letter stands for. Through this we've been covering nouns, verbs, adjectives and adverbs in grammar focusing on; identification, common/proper, collective and gender etc. We cover these through practical, interactive and written activities, hoping to develop our knowledge and to put into practice. Comprehension activities and reading activities each week. Reciprocal Reading we will look at Clarifying words from the story/ text and what we think they mean. We have been discussing in class about our hopes and fears for the coming year. Looking at possible solutions to overcome fears we may have. We will continue to follow Year 7 class work. To help improve our writing we will use VCOP strategies. We aim to develop sentence structure so that it is interesting and informative. We will produce a Blog Post and create a colourful display of winter poetry. Primary 5, enjoy designing using shapes that tessellate. Primary 5, enjoy creating designs with shapes that tessellate. Monty, wrote a comment and it was published on Newsdesk.